With Thursday here, it is time for the rundown. However, this might be the hangover posts of all hangover posts. After my Sean Carty resignation post last night, what you are about to read will be an afterthought. As far as posts that receive a high volume of views within 24 hours go, my Carty article will enter the all-time top five for Don’t Blink before the day cycle is over. Needless to say, I made sure that my five topics tonight especially sucked. Let’s get to it! Kicked Out of the Office – The building that houses our University Communication offices here at CCU will undergo a renovation this summer. With that date looming soon, all of us will be moved out by Monday. In the interim while the building is remolded, our whole team will shift to a temporary location off campus. Well, I stand corrected, actually one person will stay on campus grounds. That person is me!! Because of the nature of my job, our Vice President worked out an arrangement that will keep me on campus. For the next year or so, I will be located with Media Services in Hampton Hall. I am so thankful that I will continue to be able to cover Coastal Carolina University while still located in the heart of campus. 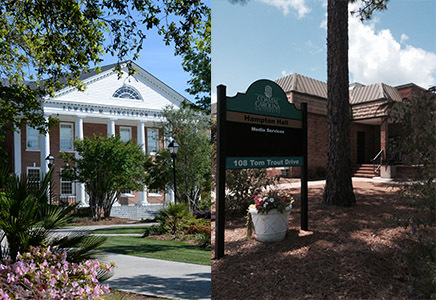 I will be moving from Singleton Hall (left) to Hampton Hall (right). A Return to Taco Bell – I used to love Taco Bell! It was a high school hangout and even into adulthood I enjoyed stopping by for food every week or so. Then I just kind of stopped going. Due in large part because I can only think of one location in Myrtle Beach, the opportunity just isn’t there in general. Before I stopped at that lone restaurant yesterday, I had not ate at Taco Bell for at least two years. When I walked in yesterday, it was like a whole different world. The menu had Fritos burritos, Doritos burritos, desserts (besides empanadas), a full dollar menu, and breakfast. What was this? The restaurant layout was something I had never seen before either. I ordered a bean burrito and Fritos burrito and went home and ate. Honestly, I had been missing out! That $3 meal was incredible, even better than I remember it. I don’t think it will be another two years until my next visit. 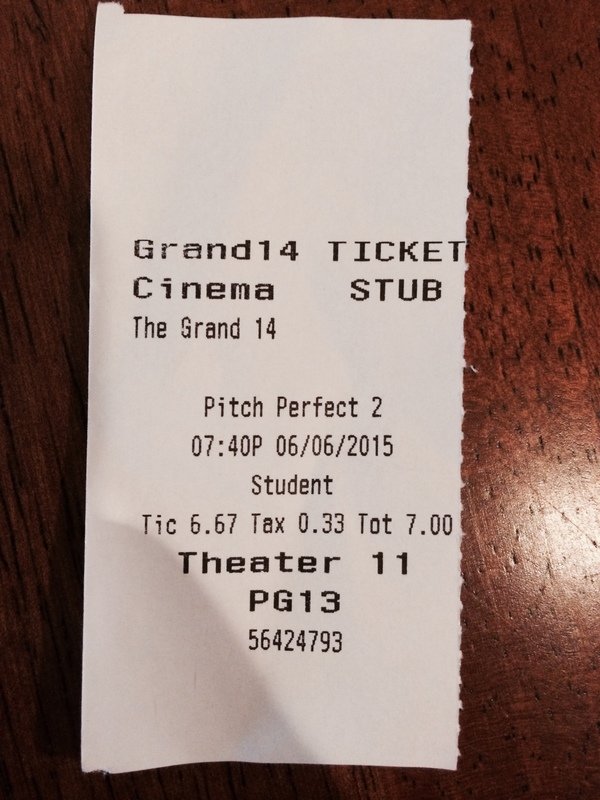 Pitch Perfect 2 – Sidney and I went and watched “Pitch Perfect 2” this past weekend. I kind of enjoyed the first one and Sidney wanted to see the sequel so it was an easy choice. We both left a little disappointed. For Sidney, she just thought it was stupid. For me, the movie lacked the iconic songs that “Pitch Perfect” provided. You didn’t have anthems like “Titanium,” “Give Me Everything,” and “The Sign.” I mean come on, they performed an ORIGINAL song for the finale of their championship routine. Who wants to see that? What really spoiled the movie for me though was just way too much Fat Amy. I am not her biggest fan and it seemed like she never left the screen. Not to mention her antics and jokes annoyed the heck out of me. My ticket to “Pitch Perfect 2”. Wal-Mart Brawl – I don’t typically write about trashy viral videos like this on my blog but since I have pretty much already called this the worst Thursday Rundown ever, this would be the time to do it. If you have a few minutes, click here to watch these two women go at it in a Wal-Mart aisle. The name calling, the swings, the commentary, and the products falling down provide all the ingredients for millions of YouTube views. The one regrettable part is the little boy who is participating in the melee. Where Were You When American Pharoah Won The Triple Crown? – I was at a Tex-Mex restaurant called Nacho Hippo in the Market Common district in Myrtle Beach. The race was on inside the full restaurant and it had everyone’s attention. As American Pharoah went down the last stretch with a big lead, everyone started cheering. To be honest, I wanted the horse to lose. Although it is cool to say that I saw a Triple Crown winner in my lifetime, I kind of like the mystique of a long streak that just can’t seem to be broken. And although he is not at Fat Amy’s level, I didn’t really want to see Bob Baffert celebrate. It is going to be a hot hot hot weekend here in Myrtle Beach. I am ready to get my half day done tomorrow and then enjoy it. Thanks to all for your loyal readership. Don’t Blink. Brent, if you like a “disaster movie” I highly recommend San Andreas with the Rock. A lot of things get destroyed because of a 9.6 Earthquake. It is definitely something I could see happening in the future somewhere in the United States.